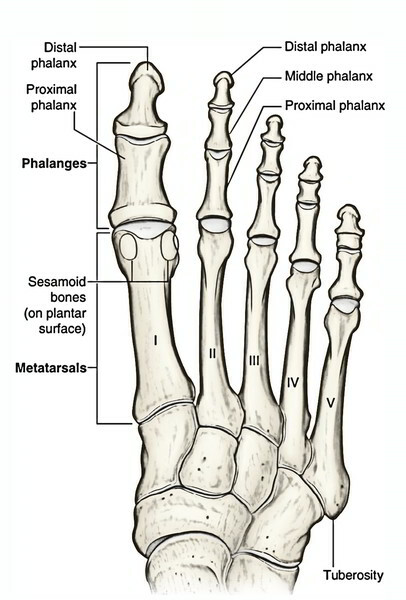 There are 14 Phalanges in each foot; 2 for the great toe and 3 for each of the other toes. As compared to the phalanges of the hand, these are much smaller in size, and the shafts particularly of the first row are compressed from side to side. Otherwise their arrangement and features are similar in the two limbs. Lateral four toes, flexor digitorum longus on the plantar surface, and the extensor expansion on the dorsal surface. Great toe, flexor hallucis longus on the plantar surface, and the extensor hallucis longus on the dorsal surface. Flexor digitorum brevis on each side of the shaft on plantar surface; and extensor expansion on the dorsal surface. Second, third and fourth toes, a lumbrical muscle on the medial side, and an interosseous muscle on each side. Fifth toe, a plantar interosseous muscle on the medial side, and the abductor digiti minimi and the flexor digiti minimi brevis on the lateral side. Great toe, abductor hallucis and part of the flexor hallucis medially, adductor hallucis and the remaining part of the flexor hallucis brevis laterally. Phalanx ossifies by one primary centre for the shaft which appears in tenth week of foetal life. The single secondary centre appears in the base. It appears in the proximal phalanx in second year, middle phalanx in third year and in distal phalanx in the sixth year. These fuse with the respective shafts by eighteenth year. The big toe has two phalanges and their secondary centres appear in second and third years to fuse with shaft in 18th year.